What is the juice of creativity; the sweet nectar that inspires us to write a poem, paint a canvas, sing from the heart or play like a child? This creative muse is called by many names, one name I’ve been connecting with recently is Shakti Kundalini. Shakti, in the Yogic tradition coming from India, is the dynamic force which moves through all forms of the universe. From the splitting of an atom to the collapsing of a star, Shakti is a primordial cosmic energy. Shakti has been worshiped as the divine energy that creates and destroys. Shakti devotees call upon her form in the different incarnations of the Goddess. Since Shakti is energy, Shakti manifests in different qualities. To harness a specific energy of Shakti we imagine a Goddess with human features yet with super human powers or Siddhis. The Goddess we invoke may be a sweet one, offering knowledge and music, or she may be fierce offering her power to slay demons of mythical and real life consequence. She has many names and many forms, and each form may have many arms, holding objects which further help us to understand her qualities. To the Yogi, each are manifestations of the Divine Mother, which animates the seen and unseen forces of nature. Having grown up in a western world where my Goddesses were princesses trapped in towers, who could only be saved by a small Italian man named Mario or sometimes Luigi, it is refreshing to know that there are spiritual practices based on the worship of the powerful feminine qualities. Furthermore, it awakens something in me to know these qualities of the Divine Mother, aren’t powerful in a modern, masculine sense of brute force or strength, but rather intelligence, creativity and fierce compassion. The most life affirming realization I’ve had while visiting India, is that singing is one of the most efficient ways to activate Shakti Kundalini, the potent creative force which exists in all humans, yet lies dormant in most. When we awaken this Shakti power, our creative capacities increase. Poets, sages, and artists all have the spark of Shakti Kundalini awakened. To chant the names of the Divine is to invoke the Divine in the space. And since your life is already divine by the nature of your existence, it is to invoke the noticing of that which is and has always been. Singing helps us remember our true nature, singing helps us remember our divinity, singing clears the stagnant energy from our system so we can more vibrantly experience the juicy sweetness of life. Sing the names of the different Goddesses, sing your favorite song on the radio, or sing a song you made up, but see to it you choose a song you resonate with. If you can, sing in a group. Group singing scientifically enhances the quality of your life. People all over the world from the Amazonian jungles to the Tibetan mountains have been making sounds together for no telling how long. When we sing together, something deep within us wakes up. We can now identify this something as Shakti Kundalini, or you can identify it as creative life force energy, or you can identify it as the molecular structure of your body, your DNA, reaching back through time and connecting with your ancestors who definitely sat in circles singing. However you identify with the feeling of community singing, I hope you have the opportunity to experience the richness of community singing. Here are the next offerings I’ll be having where we can sing together. If this medicine calls to you, I will be in Pai, Thailand until mid January. Contact me to make an appointment for a one-one sound journey through your own unique voice & integrating with a relaxation sound bath with drum, rattles, Tibetan singing bowls & other potent sounds. I can also include an Osho Zen Tarot card reading to give clarity to your sound practice. From Mid January onward, I will return to Hawaii with new songs and sounds to share. I would love to offer sound journeys, song circles, & Cacao ceremonies all with the intention to uncover truth and live with more freedom. Contact me for more information. I will be based on Oahu, but would love to Travel. To stay tuned to my travels and world-wide offerings follow me on your favorite channel. To receive my newsletter in your inbox with posts like this one, sign up for my email list choose which guide you wish to receive and input your name & email. You can also join My Facebook group where I share Sound tips, and inspiration weekly. I am at your service to hold space for your own creative nature to shine through. Sometimes we simply need to set aside time to devote to the things in our life that feel good for our bodies, mind & soul; the natural things like singing and relaxing that we seem to have placed out of sight and out of mind in our society. Come play with me and experience your truest expression. Sages, Sadhus, Scientists, & Householders: Yoga, a path for all people. Where one studies Yoga can make all the difference of whether their practice becomes a meaningful way of life or a momentary fashion. Traditional Yoga is passed down from teacher to student in communities called ashrams. Through practicing together, with a knowledgeable guide, all the aspects of Yoga from the diet to the mindful awareness, we start to experience a transformation in our health and consciousness. Being from a lineage is not about indoctrination. In many traditional schools it is encouraged to express your doubts. None of my teachers call themselves Gurus, even though in a traditional sense, that is exactly what they are. All of my teachers simply give thanks to their teachers before them who passed down the knowledge. Yogis are the wisdom keepers of the ancient knowledge of Yoga. Being a part of a lineage means we honor the knowledge & the wisdom keepers who have made it their life’s mission to better humanity through passing down the knowledge of Yoga. A teacher can be a sage (wise person), a sadhu (holy man in India), or a scientist who methodologically studies the effects of Yoga on the mind, body and spiritual evolution. A teacher can be a householder, or a traveler. A teacher can be anyone who shares some insight with you. Teachers range in experience, age, and constitution. Finding the right teacher for you is just as important as the teachings. In the lineage I have been taught, the sage, the sadhu and the scientist are all present. My teachers are also householders who have been attributed to Yoga’s modern revival in India. To meet them, follow me on this journey through time to the bank of a river in India in the 1800’s. The lineage begins with a man whose devotion to social service led him to renounce the material world, & follow the path of Yoga. Paramahamsa Madhavadasaji traveled by foot as a sadhu (monk) for 70 years gaining knowledge of practical Yoga for the development of spiritual consciousness before settling at the age of 80 by a river bank in Gujarat. Many followers gathered by the river bank to learn and live in community with this great Yogi. Paramahamsa Madhavadasaji was said to have mystical powers of healing, but for a young educated, scientific man like Yogendraji (his eventual disciple), the lure of sadhus and mystics singing in the forest came with great skepticism. However, for a lineage to be passed down, there must be a genuine student. Luckily, the spark of curiosity turns even the most skeptic among us into seekers. This spark, and deep inner knowing, brought the Great Yogi and the Scientist to meet, and the relationship of Guru and Disciple formed. This is what it means to be a part of a lineage, to know that it is not I alone who walks the path. We have great sages & even scientists to light the way. Yoga is scientific, and scientifically proven to heal certain ailments and bring peace to the mind. Shri Yogendraji, the disciple, would be the first to found an organized school for learning Yoga in India, and deliver the practice with scientific benefits as the primary purpose . Shri Yogendraji passed his school on to his son Dr. Jayadeva and his wife Hansaji. It was through their devotion to Yoga, India saw a resurgence in the practical uses of Yoga for householders. No longer did we need to roam barefoot to the jungles to receive the knowledge. This is the story of the effect we have on each other & on humanity, and how the teachings of one man sitting cross legged by the river bank over 200 years ago has lead me to the tropics, to study Yoga under sweeping vines, in an Ashram in Thailand. My direct teacher Jeenal Mehta, was taught by Dr. Jayadeva and Hansaji at The Yoga Institute in Mumbai India. She received certifications in Yoga Therapy with medical specifics to aid folks with asthma, obesity, back problems and other ailments, before receiving the blessing from her teachers to open her own school in the north of Thailand. This is how Wise Living Yoga Academy was born, through a trusted lineage. Knowing that the Yoga I am practicing has come from a legitimate place, studied with care and devotion, and passed down with the blessings from genuine teachers, helps me to walk forward with ease. I know that my intuition has guided me to a wholesome, authentic place. I know I can trust the knowledge because it is the same knowledge that has stood the test of time. Before modern science there was Yoga. Modern science & technology offers us increased proof of the benefits and effects Yoga has on our health, & happiness. Following the lineage to the present moment, as I sit under a mango tree understanding a journey walked through many lifetimes, I give gratitude for this moment, and all that has transpired to make this moment the gift that it is, full of the essence of Yoga. If you would like to make Yoga your lifestyle and share in a community experience of learning and transformation, I can only recommend Wise Living Yoga Academy. This school has provided me with the foundation for understanding what Yoga really is, and how Yoga is not contained in one place or period of time, but that Yoga is universal and can be the remedy for our modern anxieties. Wise Living Yoga Academy offers month long immersion courses to experience a traditional Yoga lifestyle. Imparting Hatha Yoga principles and traditional Yoga philosophy one can experience an inner transformation. All graduates of the program are certified and qualified to teach Yoga globally, accredited by Yoga Alliance in the US, The Board of International Yoga, as well as accredited by The Yoga Institute, the world’s oldest organized Yoga school. If you want to sign up for the month of January, receive 10% off for mentioning this blog post. When I’m inspired creatively, words flow through me like the electricity lights the bulb, as if by magic. When I’m inspired, words light up the pages of my notebooks, my pen tapping to the rhythm of my inner poetry. But when I’m blocked, the page is blank, the ukulele collects dust and the songs lay dormant in my throat. There was a moment recently where I let the page be blank. I waited for the spark to strike, and I thought to myself, when will this creative block end? And then I started to sing. Without the spark to, I just started to sing again because I knew it was the right thing to do. I started to sing & write, and then I started to sing & write everyday. The singing became the spark, and my inner pages lit up again with prose. Sometimes we wait until the perfect moment to begin a project, to make something happen, or to be happy. Because of our conditioning, we are always waiting for something to come and make us happy. When people say happiness comes from within, it is not that we’re waiting for the day happiness crawls out of us like a sleeping giant, but when we feel unhappy, we can do the things that cultivate feelings of happiness. It takes practice. This is why Yoga is a practice. Yoga teaches us that the only thing constant is change itself. So one day the sun is shining, and we’re happy and the next day there is rain and so we’re gloomy. The uncontrollable forces of nature seem to have so much control over our lives. But I don’t just give away my power that easily anymore. I know, as a creative life coach, and vocalist that singing scientifically produces the chemicals and hormones nessecary for feelings of happiness. It’s been proven in many studies that singing brings happiness. So why resist singing? What in us resists happiness? We tend to hold on to certain conditioning. Our experiences shape us, they leave a lasting mark on our subconscious long after the experience has passed. In Yoga, these mental impressions are known as samskaras. These mental impressions affect the neural pathways of the brain, and habituate us to certain ways of being, and attitudes. Samskaras are like deep grooves which keep us walking down the same path. When you’ve gone on a hike that is well known and well hiked, there is a pathway, or a groove in the earth from being walked on many times. This is the samskara. Sometimes we walk down that same pathway without awareness if it is even the best way to go. Traveling off the beaten path is a creative way to move, and takes bravery. Our past experiences have created patterns of behavior and as we continually walk those patterns we deepen the groove until we’re walking in a ditch and can’t see our way out. Do we stay in the ditch or do we ask for help? We do not have to stay in any situation or emotional state that feels like being buried. But we may need help in identifying our samskaras, limiting beliefs and unhealthy habits that are preventing us from flowing freely in our creative nature. Sometimes we just need someone to sing with. I understand that creativity naturally ebbs and flows. But for a singer, too long without singing is like a bird staying too long on the ground. As a human, as a creature of this earth, it is your divine right to both sing and be happy, and so why not do both. Why wait until your neck deep in the sand to decide to change? In this sessions, we will invite in the creative process, and see how we can map out a plan for living your most creative life. The bulb of creativity is shining bright in me once more and I’m ready to hold the light for you to discover how vibrant a life of creativity can be. A Story of All That Was Inspired & Found​ When our Young Friend Lost His Life in The River. We sat under an old oak tree, our voices rising and falling in harmony, the morning sun casting shadows on our skin. We were singing, like songbirds do, waiting for nothing, but sort of waiting for Annie, as Annies are usually off smiling in their own morning sunshine. Singing from the heart was nothing new for Mario or me, but this was our first time sharing a song together, just us. Cross-legged & rooted where we sat, we sang for the moment. No audience except the winged creatures, and a lovely sister who came to gift Mario a little plant that was meant for her grandmother. This is how much people loved Mario, they gave him their grandmother’s plants. The next day after our serendipitous meeting, Mario went down to the river to play and pray and he left his body to dance in the eternal waters. He was 22 and he was beautiful. His foot got caught in the rocks as he slid like a playful child down a rock slide, one which he had played with a dozen or so times before. He went peacefully, like a curious child, and seeker of life’s mysteries, eager to see whats beyond the river bend. When I found out, I was singing the song he had taught me. Mario was & is magic. Everything he touched turned to song. Many of us had spent the weekend with him at a transformational festival. We heard him sing into the wee hours of the morning and heard his laugh first thing as we rose up for the day. He was a singer, dancer, yogi and excellent hugger; a swimmer, a fisherman, a poet & a lover of life. He was a son, a brother & a lover. To me he was a buddy, someone I was lucky enough to share deep conversations with on whether or not he should wear the ceramic yoni necklace a friend had gifted him. I imagine he asked me questions the way he asked his sisters questions. And I know, because his sister told me, I smushed his face the way she would. I think that’s why he liked me. Mario was more than a little brother, he was a great and humble teacher. One morning, I noticed him nearby, sitting in the storytelling dome listening to the stories of the elders, while I hula hooped in the sunshine. Our eyes met and a great transmission took place. I heard: you are home, & you are free. His admiring gaze felt safe, and I felt seen. With a knowing smirk between us, my day was instantly brighter. This is how it is with the great ones. Mario was a young bird but had an old soul. He showed us what it looks like to really see and honor the beauty in front of our eyes, while not grasping too tightly. Hanging with Mario the last days of his life inspired recognition of the sweetness in my own existence and what magic powers I offer to this world. You are home and you are free. This is a sentiment that will ripple out into the universe. Mario is home now, wherever old souls go. He feels like the light, & the gentle whisper of the universe that all is well. He is a reminder to serve the community and to give kindness without expectations (I’m still working on that one). I hope to serve the community as he did in his life, and keep treasured in my memory the powerful way he brought us together in his passing. It feels real more than ever now, that each one of us has a mission here on earth. In Yoga, we call it Dharma. It is absolutely freeing to uncover your place in this existence. The sweet spot where you feel creative, at service, and in peace. When you ease into the flow of your Dharma, creativity naturally shines. When one of us remembers, more of us begin to rise in remembrance of our creative essence. To serve each other in love is one of the most creative aspects of humanity. There are so many things in this existence that need to be changed, and yet how beautiful to know change is the only consistent. Everything is shifting, transmuting, opening, closing, dying, expanding, burning & leaving. I am remembering to appreciate the beauty of all that is, of existence itself and it’s creative nature, that even in death, the vibrant light of creation becomes purer. Every emotion under the sun can come from loss, & every emotion we experience is valid. Now when I feel an emotion that is uncomfortable, I don’t look away, I lean into to it with love. I observe, think of Mario, and perpetually come back to my creative nature, my Dharma. Come back to the truth in the music. The day before Mario passed, under that old oak tree, two friends cut from the same cloth, made a pact. Two singing bards, each with one hand in the earth and the other on an instrument said we’d be there for each other. With voices that weave the tales of existence, we are all notes on this one great song, and as Mario was there for me that day to hold space for my song, I wish to be there for all of you, to honor your songs and encourage you to sing. So I’m moving forth with full love on an epic retreat in the north of Thailand this October. In our morning song & waiting for Annie convo, Mario said he wanted to start holding retreats. I told him of my upcoming retreat and asked him to be a part of it, & to share his sound and skill for creative flow. I know he will be there in spirit because his spirit lives on through us. Look into coming to this epic retreat filled with ancient Yogic practices, medicine songs, and techniques to free your creativity. We are made of the stuff of creation & it is your birthright to express your deepest truths through any medium that call to you. Let me offer you space to practice. Early birds get the discount only $390 for everything including food, 5 nights accommodation, and so many liberating offerings. Check www.freeyourcreativity.org to learn more and sign up to be involved in a scholarship contest in Mario’s honor. I’m feeling more excited than ever about this retreat knowing how proud of me Mario was when I told him it was happening. He said, “I just want to share with the world in my gifts”. Isn’t that what we all desire? Reply with how this post made you feel, & if you’re dealing with loss at the moment, I am here for you. Reply & let me know what gifts you wish to cultivate & thank you for honoring our friend Mario by sharing your gifts with the world. We are made from sound. I repeat this like a mantra to integrate this statement into my moment to moment awareness. And as the sound emerges from my lips, I feel the truth vibrating against my upper palette, sending ripples of ancient knowledge up my spine. We are made from sound. Go Ahead, Say it Out Loud. In many creation stories, if you listen with your heart, you understand that the ancient onces knew this and passed the knowledge down in soliloquy, poetry, & story. They passed this knowledge down in forests, in caves, & in sacred mountains, through lineages & councils. The wisdom keepers literally sing the knowledge in mantric tones to let the truth be heard in the deep marrow of thier bones. Have you ever stepped into a Buddhist temple & felt the vibration of chants rolling forth from the lips of the holy men? This is higher truth. Sound carries the consciousness of truth. From sages, to song writers, many have harnessed the power of sound. This practice isn’t restricted to any one culture, belief, or heritage. We are have a voice, so we all can make sounds. And if we bring intention into these sounds, we can begin to manifest great things into our lives. There’s a secret that I want to reveal to you. Sound is Sacred! Can you believe it? In the beginning there was the Word… and the Word was God. This is the message from one of the most famous sacred books in the world. THE HOLY BIBLE. In the ancient texts of the Yoga tradition, it is written that OM is the primordial sound which created the universe. The original big bang theory! Even the word Universe can actually be broken down to mean one verse – one song! We are all unique expressions of that song. We are like notes on the symphony of life. Are you catching a theme here? Science likes sound too, and has theorized that all of this reality which we see before us, our inner and outer world exists because of a big bang; a sound so powerful, that it created matter from seemingly no matter existed before. Science does a great job of studying and putting to modern words what the ancient Yogi’s, mystics, and indigenous wisdom keepers have known as sacred truth. But you don’t have to take my word for it, its the practice of chanting, toning & singing that has given me a sense of freedom & happiness that I have never really felt before. Who needs coffee when you can simply sing your favorite song to get those happiness hormones pumping through your system? I still love coffee, & plant medicines like Cacao to uplift my spirits, but the magic power of the voice is with you wherever, & whenever you are. Sure, maybe singing show tunes during your lunch break in the office might not win you the best of friends, but a self practice needs no validation from your co-workers or anyone else for that matter. Its not about the performance, pitch, timbre or tone. It’s about understanding the greater existence & connection, and using your sound to show up in the world fully connected, vibrant, & living your truth. I’m dedicating my life to helping people create a practice using the sound of their own sweet voice to activate and balance the deep layers of their human-ness. The whole of you exists in a rhythm. I work with ancient practices that tune the body, mind, & spirit to its natural rhythm, your natural song. Would you like to uncover your truth & feel confident enough to sing it out loud, to tell your story, & to let your voice be heard? 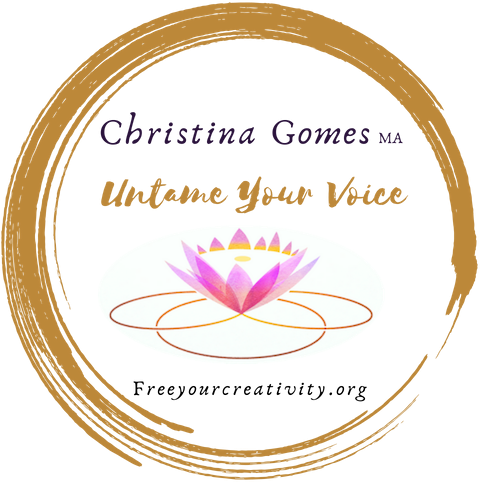 Book a FREE 30 minute call with me to start sounding your way to your most vibrant, connected, & creative life.